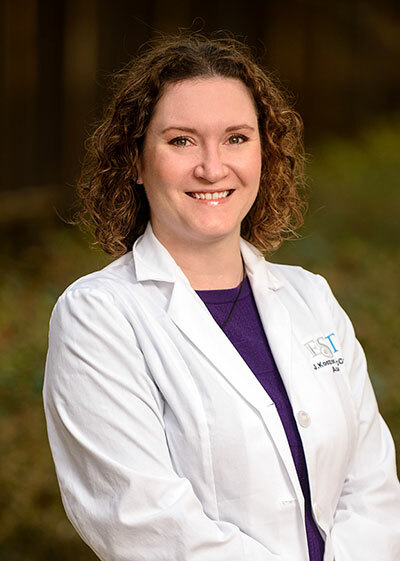 Jennifer Koczor joined the staff of ESENT in 2017 and works in our Daphne Location. She graduated with a Bachelor of Science in Communication Sciences and Disorders in 2006, and obtained her Doctorate in Audiology in 2010, from the University of South Alabama in Mobile, AL. Dr. Koczor holds a Certificate of Clinical Competence in Audiology from the American Speech-Language Hearing Association. She is also a fellow in the American Academy of Audiology and is licensed by the State of Alabama. Dr. Koczor is licensed and trained in all aspects of the ear and hearing-related disorders for newborn, pediatric, and adult populations. She provides comprehensive diagnostic services, hearing aid consultations and fittings, assistive listening devices, as well as custom ear plugs and devices. Her clinical interests include diagnostic testing, hearing amplification, tinnitus management, and aural rehabilitation. In her spare time she enjoys cross-stitching, yoga, spending time with friends, and participating in whatever activities her son and husband are doing.